Dallas Cowboys wide receiver Terrance Williams is not having a great offseason so far. 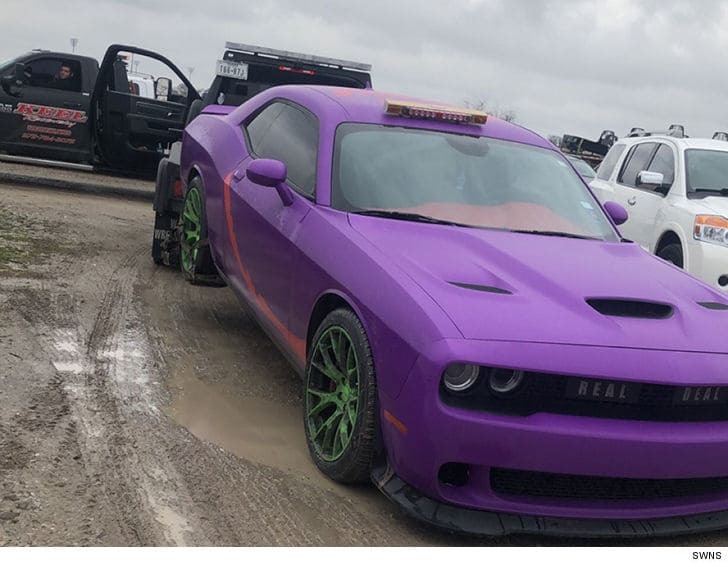 According to TMZ, Williams apparently had his nice, green and purple Dodge Hellcat repossessed. It appears that the 29-year-old wide receiver had some trouble making payments on the vehicle, even though he has made close to $14 million during his NFL career. This is not the first time Williams has found trouble with his vehicles. Last year in May, Williams was arrested in Texas on suspicion of misdemeanor public intoxication after his bright blue $200,000 Lamborghini was found wrecked into a light pole. The police found Williams away from the scene of the crime, but found the keys to the Lambo in his pocket. He denied being the one who crashed the car, and the charge was later dismissed. Williams made over $4 million last year but had to repay around $200,000 due to his three-game suspension stemming from the DUI arrest. He played in just three games and made two catches for 18 yards. In six years as a Cowboy, Williams has caught 232 passes for 3,377 yards and 20 touchdowns. The Cowboys missed Williams in the early part of the season, as the offense struggled mightily. But everything changed when the Cowboys acquired Amari Cooper. Dallas went on to win seven of its next nine games and rallied to claim the NFC East title. With Williams on the sideline, the offense continued to improve. Cooper emerged as one of the best receivers in the NFL, putting up 725 yards and six touchdowns in nine games, running back Ezekiel Elliott led the NFL in rushing yards and recorded a career-high in receiving yards with 567 and rookie wide receiver Michael Gallupdeveloped into a nice compliment piece to Cooper, recording a touchdown in the Wildcard round against the Seattle Seahawks and led the Cowboys in receiving yards with 119 in the Divisional round against the Los Angeles Rams. The Colorado State product seems to have a bright future in the NFL, and the Cowboys may now be considering their options with Williams. This young Cowboys team won their first playoff game since 2014, and they didn’t need Williams to do it. While we don’t want to speculate, the repo man showing up to Williams’ place isn’t exactly a good sign. We hope that the receiver is healthy and gearing up for a productive 2019, because the Cowboys would benefit from having another electric receiver ready to go. Dallas could choose to go a different direction however. It’s apparent that the team doesn’t need him, and with Cooper in the fold, Gallup coming on strong and several other options coming their way in the spring — eating a $5.25 million cap hit on a player who seems checked out and offers little production is a no-go.